Hear (shama) means to hear, to listen. Webster's on "listen" = to hearken; to give ear; to attend closely with a view to hear. To obey; to yield to advice; to follow admonition. Since hearing/listening are often closely linked to obedience, shama is translated obey or to understand. KJV translates shama "hearken" a word which means to give respectful attention. Shama means “to hear intelligently and attentively and respond appropriately." The most famous use is the so-called "Shema" in Dt 6:4 “Hear, (a command, in the Greek translation of the Hebrew scriptures, the Septuagint states, "present imperative - habitually, continually.") O Israel! The LORD is our God, the LORD is one!" “You shall love the LORD your God with all your heart and with all your soul and with all your might. Look In—as you meditate on I Samuel 3:10 … pray to see how you might apply it to your life. Be propelled to ask galvanizing questions about your discoveries: "Because God is_________, I will_____________." Samuel is such an encouragement! I also like the quote about if you find you can’t pray, let Him speak to you instead! After all, conversation is a two way thing. Beth, thank you for your study on the 1 Samuel 3:10 verse. I love this verse and the whole passage because Samuel is so attentive, so open to hearing what God desires and so obedient to God's call. I pray that I too would have such ears to hear, a receptive heart, and an obedient will. Oh, sweet friend! This really ministered to my heart tonight, as we are seeking God so intently to know His perfect will for what is up ahead of us. I was so encouraged by Charles Spurgeon's words about young Samuel. Oh, Lord, help me to hear Your voice when you speak! The other day, my dear husband was praying, and he asked the Lord to help us not to miss what He is saying to us. That really resonated with me. I don't want to miss anything, and we often need to get so still and quiet before Him to be able to hear those whispers. The world is so noisy and tries to drown it out, but He is still speaking to His trusting children. Thank you so much for another edifying, uplifting post, my friend, and thank you so much for your precious, anointed prayer for my mother-in-law. God is hearing and answering! Sending much love your way! Cheryl, your precious comments really ministered to my heart today. It is such a blessing to know that you are encouraged by that which our Lord and Savior Jesus Christ has used to encourage me. It was such a joy to meet you during the Christmas holidays last year, and please know that I am lifting you and your sweet family up to our Lord in prayer. Many blessings to you all! I love how you dive deeper into the meaning behind a verse. You provide such wonderful background that helps me as I make connections with God's Word. The best part for me with how Samuel responded is that he made space to hear from God. I wonder how many times we actually make room for God to respond and listen and follow through? Thank you for doing that amazing research! We can all do with saying the same as Samuel to the Lord & waiting for His response. Jennifer, thank you so much for stopping by with your words of encouragement. Many blessings to you! Lovely words. Thank you for sharing. I remember teaching this lesson on little Samuel when I was a teen, and being challenged to the bone myself as I taught. I love his heart! Yes, Michele, sharing God's Word with others always challenges us to reflect what we are sharing for sure! 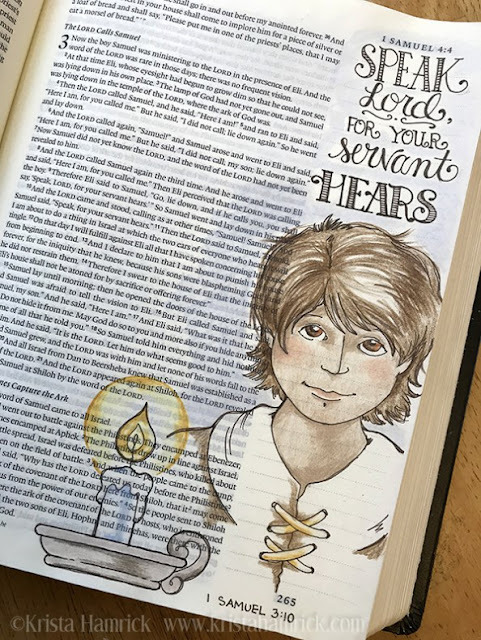 I'm just amazed at how much more I think about "little Samuel" since I did this study, whenever I read about him anointing and later confronting both King Saul and King David. Amazing how God draws us, anoints us, equips us, and loves us so. Truly, all is grace. Many blessings to you dear friend. Beth, the artwork makes the words of this favorite Scripture shine! 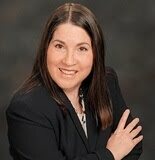 Linda, I so agree with you about Krista Hamrick's extraordinary talent--she constantly inspires me! Many blessings to you! Oh, how I want to linger and listen so that the Lord shows Himself clearly in my life. This is so powerful as we ask the Lord to speak to us...in whatever way that takes. I love it all. Linda, I'm right there with you...I think we would have been right there at Jesus' feet with Mary...leaning in and listening longer. I love this story of Samuel. Thank you for breaking down the verse as you did. Jennifer, thank you so much for stopping by. It is a joy to link up with fellow sisters in Christ at Woman to Woman Ministries. Many blessings to you! So, so good! I'm saving this link to share with my readers when we start discussing our 5th and final sense, hearing, in my current series on Experiencing God. Blessings!! Liz, I LOVE Experiencing God--this is my favorite quote: "For his sixth birthday, my oldest son Richard was old enough to have a bicycle. I looked all around for a bicycle. I found a blue Schwinn. I bought it and hid it in the garage. Then I had a task—to convince Richard that he needed a blue Schwinn bike. For the next little while, we began to work with Richard. Richard decided that what he really wanted for his birthday was a blue Schwinn bike. Do you know what Richard got? Well, the bike was already in the garage. I just had to convince him to ask for it. He asked for it, and he got it! What happens when you pray? The Holy Spirit knows what God has "in the garage." It is already there. The Holy Spirit's task is to get you to want it—to get you to ask for it. What will happen when you ask for things God already wants to give or do? You will always receive it. Why? Because you have asked according to the will of God. When God answers your prayer, He gets the glory and your faith is increased." I always felt it was such a great illustration of how the Holy Spirit speaks to us through prayer...as we "listen" to Him. The story of the young Samuel hearing God's voice was one of my favorites when I was a child. So I loved hearing these beautiful thoughts that you have gathered here Beth. And the deeper definitions of "hear" in Hebrew add so much to my understanding. May I truly "shema" my Lord today! Great post! I learned something new about the word, Shama! Love the quote by George Muller too. Sometimes, when we can't find the words to pray, its simply best to let God do the talking! Rachel, I so agree with you about the George Muller quote, God knows our heart, and He is always speaking, we just need to be listening. Many blessings to you! Annette, thanks so much for stopping by. It is a joy to share encouraging words with sweet sisters in Christ at #dreamteam linky! Many blessings to you!